Mormon Mommy Writers and Friends: Who are you? As I've shared on here before, I am an introvert. In fact, I think many of us writers are. 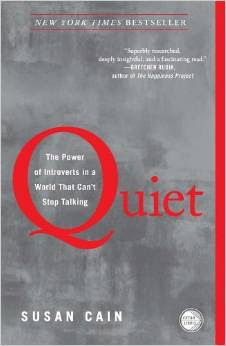 Recently, my mom lent me a book called, "Quiet: The Power of Introverts in a World That Can't Stop Talking." It has opened my eyes to the good things about being an introvert, and made me realize that it's okay- I can embrace my introverted nature without being a freak and a loner. As I have gotten older I've become very good at faking being an extrovert, because I've always felt like that's what's "normal" and what people expect. Plus, I see that Extroverted Kasey as being more friendly, more helpful, and more useful, and who doesn't want to be friendly, helpful, and useful? But as I've been reading this book it's helped me to realize that I am not alone- introverts are all around me. Is it possible they just want to be quiet too? I decided to put that theory to the test the other day when I went to get my hair done. Typically, I really hate getting my hair done because it requires a lot of small talk, and it's exhausting to me. (I think that's why many people go back to the same hairdresser time after time: the more you go to them, the better you get to know each other and the deeper the conversation can become- we introverts hate small talk, but give us some deep conversation and we're happy campers- well, until we're done, anyway). So I decided that I would assess the situation with the hairdresser before I launched into small talk. I sat down in the chair and smiled in a friendly way and cheerfully answered the questions she asked me about how I wanted my hair. I thanked her when appropriate, cracked a little joke to assure her we were friends, and then I shut up. I decided that if she wanted to talk, she would. And I would talk back. But if she didn't, then I wouldn't either. We could just be quiet. By the end of the appointment I felt very zen. I had embraced my introverted self and allowed my hairdresser to embrace hers, and it felt very good to do so. I have started using this as a parent as well- I know my son is introverted, and so one day when I took him to Scouts and it was just the two of us in the car, I didn't talk. I knew that he had been at school all day, then had come home with all of his crazy sisters, then spent the last hour and a half at his sister's gymnastics class goofing off with some other boys, then we had all come home and had dinner- I knew that I needed a break from being "on" for so long, and I had a sneaking suspicion that he probably did too. Normally, I would have thought, "Oh look, here is one of those golden opportunities- we're alone, I can pepper him with questions about his day, and we can have a heart-to-heart!" But I shoved those thoughts aside. We both needed a break. So we were quiet. He read a book. I drove. And it was fine. That's not to say I will always do this, and I'm sure we would have both been equally fine had we had a nice chat. But it was a nice change of pace. I also realized as I read this book that it had been awhile since I had taken the Myers-Briggs personality test, so I found a website that offered something similar in the form of this free test. I took the test and my results were INFJ- Introverted (100%, by the way), iNtuitive, Feeling, Judging. Apparently it's quite a rare personality type- only 1% of the population is INFJ. 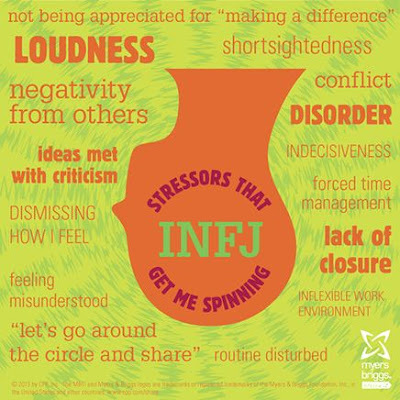 Once I got my results, I went to Pinterest and typed in INFJ, just for fun, to see what popped up. What fun! I felt like the screen suddenly came alive with a world that *got* me! A meme: "For INFJs, every day is a battle between wanting to be recognized for the qualities that make us unique and not wanting to be too noticed because of them." I just gave a talk in Sacrament, which I don't mind too much (I just write out what I want to say and read it), but I told my husband that for me the worst part is afterward when everyone wants to tell me what a good job I did. TORTURE! It's not that I don't appreciate it, it just feels unbearably awkward. Just send me a note! Another thing that I really identified with was the "empath" label for INFJs. I sometimes feel others' pain so strongly that I will cry for them, ache for them, and literally feel like what happened to them has happened to me. It's can be very stressful, but also very good because I get very determined to help in any way possible. This empathic part of me is also one of the things that can make being a mom so stressful- whenever my kids fight their anger seeps into me and it's hard not to feel angry myself. It's a constant struggle. But then again I also feel very happy for other people who are happy, so it's not all bad! It was so fun learning about myself that I tested my son (INTJ) and my husband (ESTJ- almost my polar opposite). It was a great exercise for me because, for example, now when I feel like my husband is being closed-minded, I can remind myself that it's part of his personality to be very traditional. He is a firm believer in the "if it ain't broke, don't fix it" mentality. My husband's very favorite thing he found was a meme that said, "My bad. How insensitive of me. I asked to to stop being stupid without realizing how difficult that must be for you." Ha. Him ALL the way. I made it into a bumper sticker for him for Fathers Day. So what about you? Who are you? And who are your characters? I have become an introvert. The older I get, the more I like it! I'm going to check out this book, thank you for sharing!